Had to brush the dew off my bed so I could sit down. Not the kind of dew you're thinking of either. That funny smelling weed is what I'm talking about. I came in from the movie at about 9:30 and there were about 7 guys squeezed into this little room, not bigger than about 4 telephone booths. There were three on my bed. One rolling jays and the other two smoking away. The aroma is enough to make your head roll. It's interesting just to watch how these guys operate. When it gets too short and hot to hold they clamp it in the cover of a cigarette lighter. They don't waste an ounce. I could say more but I can't see wasting the paper. To say the least I'm living with a bunch of potheads. They're all ordinary guys and they don't mean any harm. They just have their own way of having fun. It's amazing how they even accept a straight like me. I just tell them it's not my thing and they don't press the subject. Just as long as I don't blow the horn on them. Maybe I shouldn't even tell you about it, but drugs are a big part of living in Vietnam. I don't want you to worry about me becoming a dope fiend or something. I've learned to live with this drug scene, but without the drugs. Sometimes I wonder why. I guess I was just brought up to think different than other people. I get my high thinking of how short I'm getting. Somebody just turned out the lights so I'll have to write by my flashlight. I caught a cold yesterday. It might even be hay fever. My throat is real dry and my nose is running away with me. Aha! The lights are on again. The light switch is out in the hall. 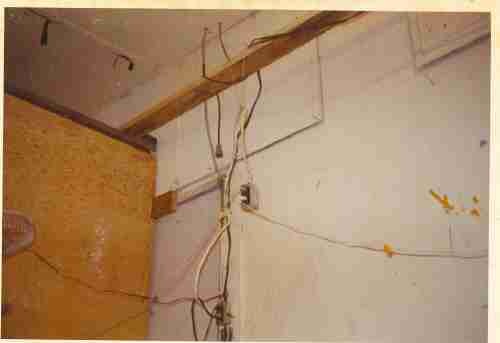 I'll have to get a picture of our wiring set up in this room. We've got a spider web of extension cords. The movie I saw this evening was the same one I saw yesterday "Paint Your Wagon" It was really funny and Kadramas hadn't seen it so I went with him. He leaves to go south tomorrow. He goes to Bangkok for R&R on Thursday. He's going to take my puzzle ring and see if he can get it fixed or replaced. One part of it broke today. I've been reading "Please stop killing me" by Dr. Everet E. Snyder. It's another one of those countdown to ecological disasters by a scientist. It's kind of boring. I've read that stuff so many times I think I may put it aside for a while and try Dr. Norman Vincent Peale and his "Enthusiasm makes the difference" I know it will be a little faster reading. The weather is hot but I'm just soaking it up as a reserve for those cold winter fishing trips.